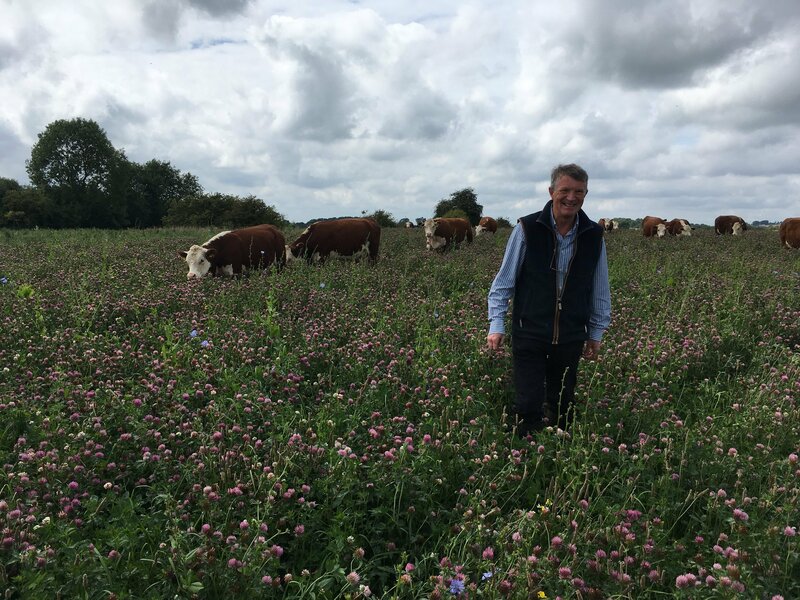 A cheery Ian Boyd with his cows in a field of clover and wild-flowers knee high. The whole farm is covered in wildflowers! I arrived at Whittington Lodge in the Cotswolds on a very grey and damp day in August. A cheery Ian Boyd greeted me and immediately put the kettle on. At first Ian seemed very wary as I told him I’d made an app that was going to help him monitor his soil health that we were trying out today. I don’t blame him for being suspicious, I am a British girl with a distinctly American accent, wearing leopard-print leggings and claiming that I had created an app that could help him out in the field. Who wouldn’t be suspicious!? 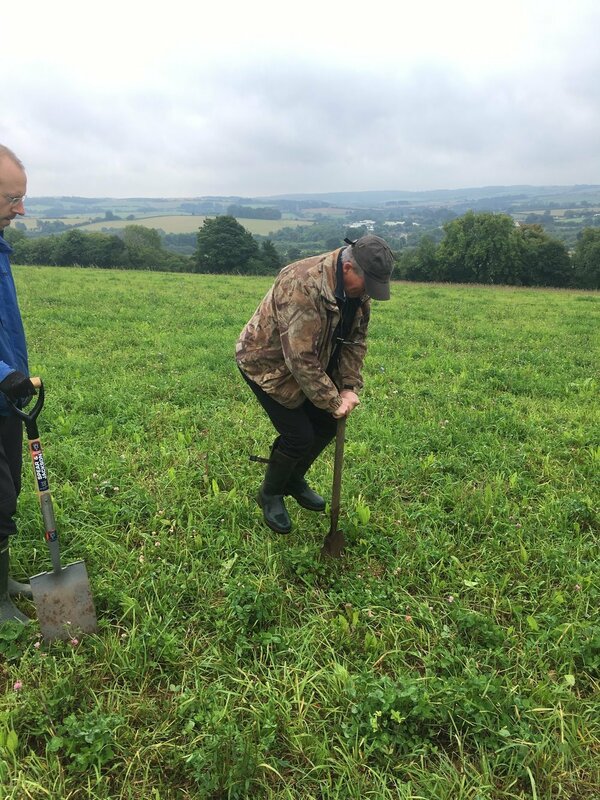 I was there on the invite of Niels Corfield, a soil health advisor who is setting up a framework so that farmers can use a combination of visual methods to assess the health of their soils. He is doing this in conjunction with the Pasture Fed Livestock Association (PFLA) a relatively young organisation that certifies and provides resources for about 300 farmers who are committed to farming animals solely from their pastures. 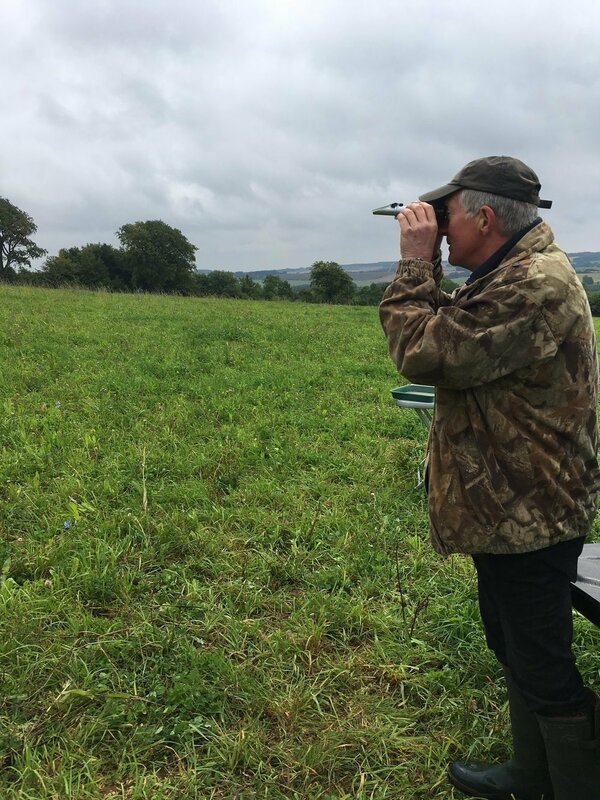 This practice requires careful soil and sward (grass) management to ensure the animals always have something to eat out in the fields. This type of farming can also be extremely regenerative for soils, as the animals help to return critters to the soils and this practice is thought to have the potential to sequester large amounts of carbon in the soils. Back to the misty farm – Niels, Ian and I bundled into the trucks with our simple tools – a spade, a card-table, few trays, soil corer, garlic crusher and a refractometer. First thing you notice when you get out into Ian’s fields is that there are wildflowers everywhere, the fields are alive with colour. We trundled over to Fir Hill, setup the card table and got to work. Ian downloaded the app on his phone, and we walked around the field counting the % of undesirables (i.e weeds), % of bare earth, no. of grass species, no. of broadleaves and more every 60 steps, Ian recording it all himself using the app. By lunchtime Ian was so excited, all reservations abandoned, he was telling all the newcomers about how easy he had found the different visual tests Niels had put together, and that the app he used to record it all was no trouble at all to use to note down results. I was thrilled at the turn around and his enthusiasm – It’s moments like this that make me realise bringing simple digital technology to the sustainable farming sector is so worth it! Ian jumping on the spade to do the spade tests. Ian looking through his refractometer to get a Brix reading. Preparing to do a Brix test, with a garlic crusher and a good handful of the foliage from the field. 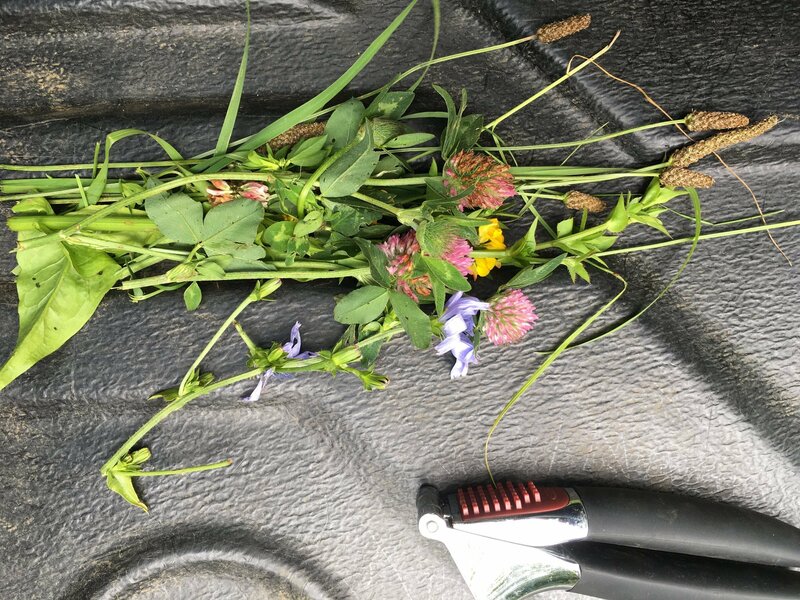 Quite a bit of diversity from the herbal ley Ian planted. A bit about the app, my parents moved to Chile over ten years ago and planted 8000 olive trees. We experienced repeated frost damage on a few hundred trees and so I devised an app to help keep track of this. We have now collected over 2 years of data and are starting to use it to make decisions on our farm. We started selling the app to fellow farmers just under a year ago and now have blueberry growers, vineyards, agroforestry projects and more using it in the UK, Chile and US. 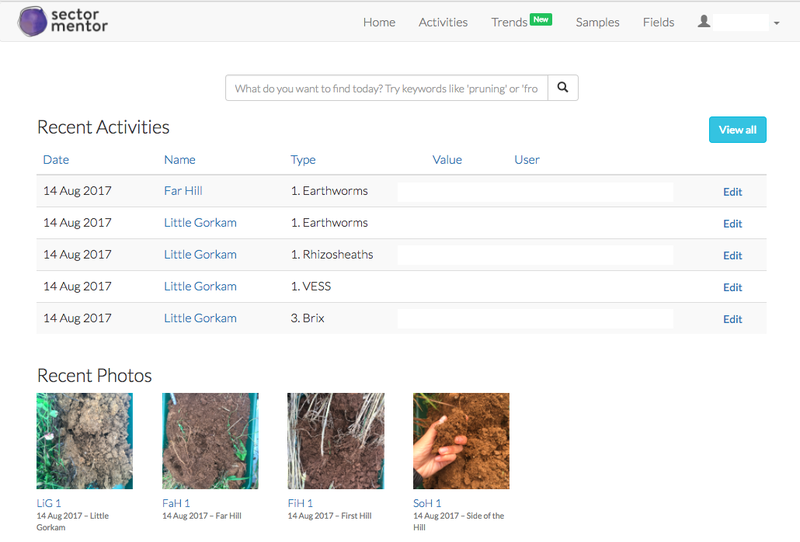 But why is this app relevant to the soil health on Ian’s mixed arable farm in the Cotswold’s? Customised settings: Firstly the app is incredibly customisable. On our farm we set it up to record information about pruning and frosts, but you could set it up to record whatever you want. So before heading to Ian’s farm Niels and I sat down and went through the different visual tests he had learnt were helpful on farm. We added a list of them all, with a list of options to choose e.g bare soil – 0%, 25%, 50%, 75%, 100% or a numerical value for the Brix reading. This means that Ian picked up the app and basically had a checklist of everything to record in his field, no typing necessary. Easy to use: Secondly we made the app incredibly simple and easy to use with big buttons (my dad is not the nimblest of typers). We had to do this because we wanted anyone on our farm to be able to use the app with almost zero training. This means a super farmer-friendly app, something I think Ian would attest to. Making data understandable: Finally we are now focused on providing helpful graphs and analysis that make the data interesting and easily understandable for the farmers – this is what we will be focused on going forward with Ian and Niels. As farmers ourselves we think it’s so important to have data that is really useful for your own farm. The digital collection of data like this also means that farmers will be collecting a consistent data set across many farms – this can therefore be combined across farms to build an evidence based that is so important for informing policy and providing vital info to the PFLA. Some of the results (whited out) and photos from the initial visit. 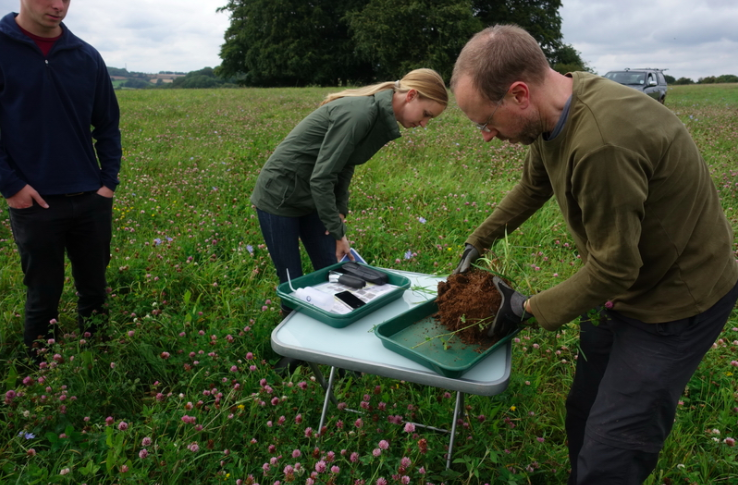 We are incredibly excited to be working with Ian, Niels and PFLA to support visual assessment of soil health by farmers. Our next steps are to work with 2-3 PFLA farmers who over the course of the year will use the app to do these soil assessments on their farm every couple of months. That way we can help them figure out the best way to monitor their soils themselves and also the best way for us to visually show any results. This is all so that farmers can feel enabled to manage the health of their own soil and learn what indicators really show improvements in their soil health. This will also benefit the PFLA to see across multiple farms what the best indicators are and share these insights with their members and maybe even policy makers! If you are interested in using Sectormentor to monitor data on your farm don’t hesitate to get in touch with us on info@vidacycle.com. We would love to hear from you!